CLOSED - On 24th November 2010 a planning application was lodged to convert the pub into 8 self-contained flats along with 168m2 of office space. 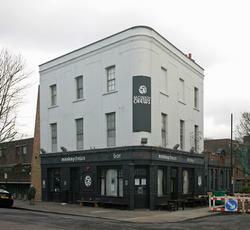 Formerly the Queens Arms, in late 2010 the bar area was gutted and the windows and doors were boarded up. Love this place. New owners since the beginning of the year who made me feel welcome immediatley as well as all the other staff who are really friendly. Fast service even if busy. Great food. QUirky, always something going on - music, comedy, art exhibitions, quiz nights. Sometimes feel like Im going round to my mates larger than average lounge for a good night.